We have published 3 versions of this map, showing how the area developed over the years. Coverage stretches from Middle Lane and Nightingale Lane eastward to Langham Road and Etherley Road, and from Pemberton Road northward to Coburg Road. 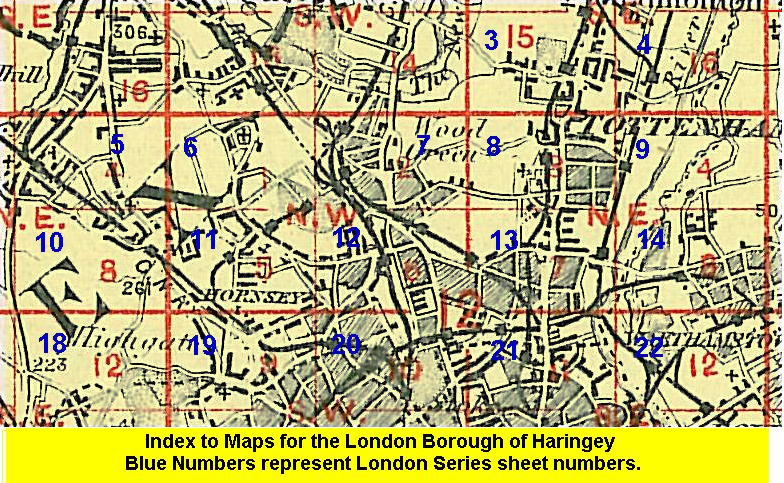 Features include Ducketts Green, Coleraine Park area, Hornsey Park area, Moselle Park area, Hornsey Glebe, Lister Park, Hornsey Vale, part of Alexandra Park racecourse, stretch of GNR main line with Hornsey station, Ferme Park Sidings, Rathcoole, Harringay Park area, tramway, stretch of GER Alexandra Park branch, Christ Church, St Mary's church Hornsey, Holy Innocents church etc. The map links up with London Sheets 7 Wood Green to the north, 11 Muswell Hill to the west, 13 Tottenham to the east, and 20 Finsbury Park to the south.